The Argentinosaurus huinculensis, one of the largest dinosaurs ever discovered has been digitally reconstructed to study how it walks. The Argentinosaurus is a dinosaur that lived around 94 million years ago. The virtual model was reconstructed through a computer technique that involved the computing power of 30,000 desktop computers. The Argentinosaurus (named after the country it was first found; Argentina) is the largest dinosaur ever discovered and is the longest and heaviest land animal ever. An adult 40 year old Argentinsaurus can reach a size of 37 meters and weighing around 75 to 100 tons. The herbivore lived during the Cretaceous period and was believed to have perished during the end of the Jurassic period with a few of its relatives surviving in South America. The dinosaur is a social animal that moved in herds of 20 or more. It stripped vegetated areas of leaves, seed and fruit before moving on to find a new place to graze. By digitally reconstructing how the Argentinosaurus moved, the study can contribute to the development of locomotion and movement technology as it applies to musculoskeletal systems and for developing robots. One of the world's largest dinosaurs has been digitally reconstructed by experts from The University of Manchester allowing it to take its first steps in over 94 million years. The Manchester team, working with scientists in Argentina, were able to laser scan a 40 metre-long skeleton of the vast Cretaceous Agentinosaurus dinosaur. Then using an advanced computer modeling technique involving the equivalent of 30,000 desktop computers they recreated its walking and running movements and tested its locomotion ability tested for the very first time. The study, published in PLOS ONE today (Wednesday 30 October), provides the first ever 'virtual' trackway of the dinosaur and disproves previous suggestions that the animal was inflated in size and could not have walked. Dr Bill Sellers, lead researcher on the project from the University's Faculty of Life Sciences, said: "If you want to work out how dinosaurs walked, the best approach is computer simulation. This is the only way of bringing together all the different strands of information we have on this dinosaur, so we can reconstruct how it once moved." Dr Lee Margetts, who also worked on the project, said: "We used the equivalent of 30,000 desktop computers to allow Agentinosaurus to take its first steps in over 94 million years. "The new study clearly demonstrates the dinosaur was more than capable of strolling across the Cretaceous planes of what is now Patagonia, South America." Dr Phil Manning, from Manchester who contributed to the paper, said: "It is frustrating there was so little of the original dinosaur fossilized, making any reconstruction difficult. The digitization of such vast dinosaur skeletons using laser scanners brings Walking with Dinosaurs to life…this is science not just animation." "The important thing is that these animals are not like any animal alive today and so we can't just copy a modern animal," he explained. "Our machine learning system works purely from the information we have on the dinosaur and predicts the best possible movement patterns." The dinosaur weighed 80 tonnes and the simulation shows that it would have reached just over 2 m/s - about 5 mph. He added: "All vertebrates from humans to fish share the same basic muscles, bones and joints. To understand how these function we can compare how they are used in different animals, and the most interesting are often those at extremes. 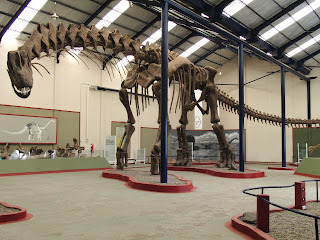 Argentinosaurus is the biggest animal that ever walked on the surface of the earth and understanding how it did this will tell us a lot about the maximum performance of the vertebrate musculoskeletal system. We need to know more about this to help understand how it functions in ourselves. "Similarly if we want to build better legged robots then we need to know more about the mechanics of legs in a whole range of animals and nothing has bigger, more powerful legs than Argentinosaurus."